Title: Der Kibo-Krater des Kilimanscharo. Measurement Notes: Estimated prime meridian Greenwich. Kilimanjaro: Lat. -3.075833; Lon. 37.35333. Notes: 1st climb to summit of Kilimanjaro; Upper Left Corner: "Petermann's Geographische Mitteilhungen." Upper Right Corner: "Jahrgang 1890. Tafel 2." 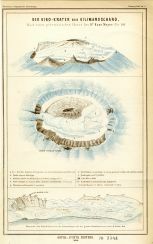 Sketch divided into three parts: on top: cross section of the Kibo crater of Mount Kilimanjaro; at the center: sketch of the Kibo crater (bird view); at bottom: panorama of the Kibo craters 19 October, 1889.